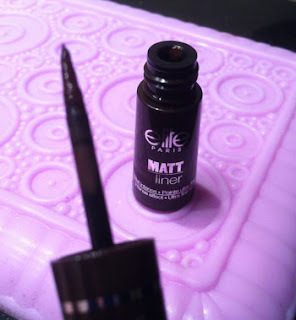 THE SKINNY: I am digging everything matte right now -- matte finished nails, matte eye shadows and this matte eye liner from Elite Models. The Glossybox find went on amazingly easy and dried quickly for a liquid eye liner. The brush was nice and thin, making for an easy and mess-free application. Plus the color was fantastic.The deep brown would compliment almost any eye color and the flat finish was stunning paired with a neutral eye. Sadly, this product is very difficult to find. Made in France, it appears to only be available in the United States through Glossybox. KEEP OR TOSS: Keep. I am seriously loving matte liners right now. CHECK IT OUT: Elite promises American distribution soon. Be on the lookout for it!